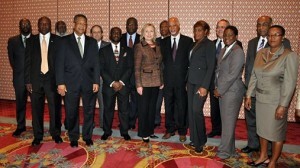 On June 22, Secretary Clinton attended the High-Level Caribbean-U.S. Conference to discuss progress in the areas of regional security and renewable energy. She reported a funding increase from USD 44 million to USD 77 million in the fiscal year 2011 for the Caribbean Basin Security Initiative (CBSI), a program which consists of counter-trafficking and maritime security programs. Adding to the security funding, Secretary Clinton also announced the conferral of grant funding for pilot projects in renewable energy. Generally speaking, Caribbean nations struggle economically from high levels of debt, natural disasters, and an exodus of skilled workers to more developed countries. Their small sizes and limited tax base generate a constant state of fiscal instability. As an extreme example, St. Kitts and Nevis’debt is 170 percent of their GDP. In its support of the region, the U.S. State Department focuses broadly on developing institutional reform, youth programs, and human rights support. However, as the majority of U.S. support goes to defense and security spending, these broad and commendable goals are not reflected in the actual financial assistance. The Caribbean is a strategically located shipping route, making it critical in both formal international trade and illicit narco-trafficking. To defend maritime routes and economic interests, the U.S. tends to prioritize security funding in its policy toward the Caribbean. At the 2009 Summit of the Americas, President Obama initiated the Energy and Climate Partnership of the Americas (ECPA) to address the need for cleaner and more sustainable energy use in the hemisphere. With funding and support from the U.S. Government departments, the Organization of American States (OAS) and the Inter-American Development Bank (IADB), ECPA has implemented a range of initiatives proposing wind, solar, biomass, and other clean energy programs in the region. For example, ECPA’s Caribbean Initiative provides funding, legal counsel and technical assistance “to facilitate regional dialogue and assist Caribbean governments to promote and implement sustainable energy policies and programs.” The Caribbean faces multiple environmental problems caused by the polluting nature of many cruise ships and tourist resorts, as well as the islands’ dependence on oil as a fuel; some islands record extremely high carbon emission per capita – over 6.0 metric tons per person per year. Secretary Clinton’s newest pronouncement is evidence of expanding U.S. support for social and environmental initiatives in the Caribbean. 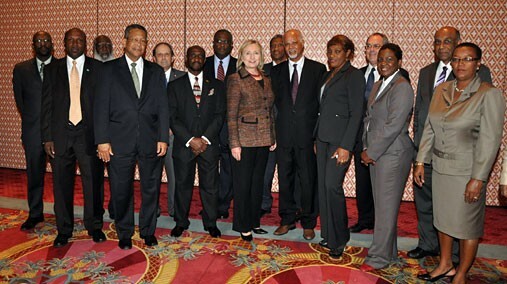 While in Jamaica, Secretary Clinton announced that ECPA had awarded technical assistance grants to six Caribbean nations for renewable energy initiatives and feasibility studies. Antigua and Barbuda will apply solar energy technologies to generate power in their national parks. Dominica will expand the use of solar water heaters throughout the island. The Dominican Republic will install a photovoltaic system to supply electricity demand for the National Energy Commission. Grenada will draft a Geothermal Resource Bill to advance plant construction. Jamaica will run a feasibility assessment for wind-powered immigration Finally, St. Vincent and the Grenadines will run a feasibility study on a photovoltaic project for their Administrative Building. These initiatives were chosen from twenty proposals submitted to the ECPA based on technical merit and use of available solar and wind resources. While solar power seems logical for such a sunny region, many island nations struggle to implement plans due to financial and territorial constraints. The Jamaica Conference also unveiled the ECPA Caribbean Adaptation Initiative, which will pair universities in the United States with the University of the West Indies to expand research capabilities and local technological capacity. The program, while admirable, fails to address the issue that the vast majority of professionals and college graduates in the Caribbean emigrate for greater opportunities. The technical brain drain negatively affects the feasibility of renewable energy projects, in addition to causing problems in politics, medicine, and academia. Thomas Adams, the Special Coordinator for Haiti at the U.S. Office of the Secretary of State, said in a Diplomacy Briefing Series on the Caribbean, that 80-87 percent of Haitians with university degrees live outside of Haiti. The Caribbean, with its thirteen island nations, is an oft-forgotten region for foreign policy that typically makes news only with stories of natural disasters, reggaeton, or tempting references to vacation opportunities. Renewable energy projects have the potential of long-term benefits for these tiny nations, ideally enabling them to become energy-independent. Unfortunately, while the United States may be well intentioned in funding these energy projects to improve Caribbean relations, they still focus too exclusively on security issues and overlook the fundamental, and often daunting, social and economic challenges facing the Caribbean countries.